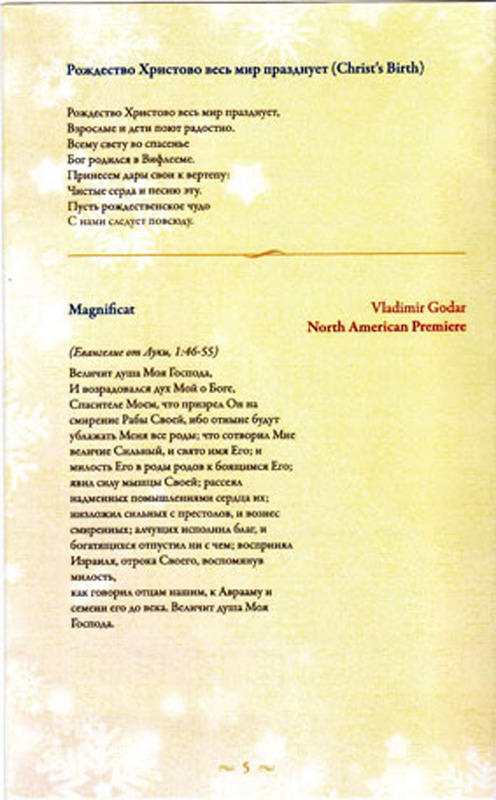 American choir Slavic Chorale (http://slavicchorale.org/) performed the piece Magnificat by Vladimír Godár among others at the Christmas Concert in Citrus Heights, California, on December 19, 2010. 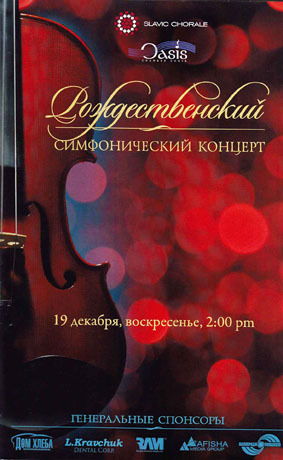 The soloist was Alina Ilchuk, the choir and orchestra was conducted by Pavel Kravchuk. Roughly 3 500 listeners visited the concert. 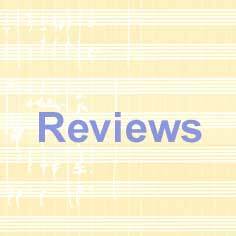 More about the event and reactions of musicians and listeners on the page Reviews. Two CD recordings were released at the end of 2010, with pieces by Vladimír Godár among others. Girls’ choir from Oxford The Hildegard Choir led by Gulliver Ralston recorded the version of Dormi, Jesu, written especially for the soloist Emily Van Evera and the choir. The soloist excels also in the second piece on the CD, Ecce puer. Emmeleia for four guitars was recorded by Bratislava Guitar Quartet for the Diskant label. More info on the Discography page. 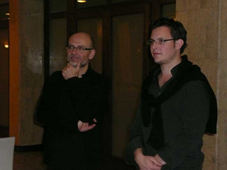 Fans of Vladimír Godár’s music got an opportunity to listen to his mesmeric composition Dariachanghi’s Orchard at the festival Ars nova cassoviae in Kosice on November 11, 2010. 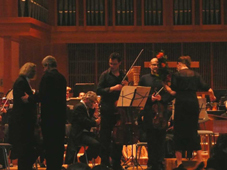 Slovak State Philharmonic Košice was led by the conductor Peter Breiner, viola player Milan Radič and cellist Florian Simma, both from Salzburg, performed the solo parts. Flawless and enthusiastic rendering of the soloists, conductor and the whole orchestra resulted in an extraordinary experience, rewarded by the standing ovations after the performance. 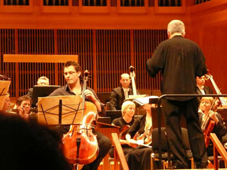 Music for Trnava – this is a little music festival organized by the Slovak cellist Ján Slávik. 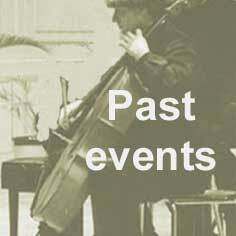 This year it was headed by the motto Homage to Piano Trio. 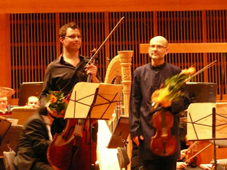 On October 10, 2010 a concert consisting of the pieces by Vladimír Godár and Ludwig van Beethoven took place in the Mansion of Dolná Krupá. The musicians were singer Petra Noskaiová, violinist Peter Hamar, cellist Ján Slávik with Vladimír Godár at the piano. From the Godár’s pieces you could hear pieces Talisman, Lullabies after Jan Skácel, and a song What does little birdie say?. musicians fought on the Pohoda stage in the night from 9th to 10th July 2010 an unbelievable noise and pother from the nearby stages and funfairs. Despite the original promise of the organizers that the performance of Godár’s piece Querela pacis would take place in the midnight silence, the rival techno percussion appeared to be an unconquerable obstacle for the music in which "piano" and "silence" form essential musical elements. 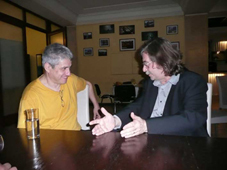 According to previous press releases of the festival director Michal Kaščák the composition should have been the "gem" of the festival programme and its premiere "honour" for its organizers. Nevertheless, the totally outrageous conditions did not prevent the musicians from playing the complete composition. The question arises, whether the premiere was accomplished or not, as neither the listeners nor the performers heard anything at all. The 36 brave ones: Hilda Gulyásová, Petra Noskaiová, Tomáš Šelc, Andrew Parrott, Cathedral Choir of St. Martin led by Dušan Bill, Solamente naturali ensemble with the concertmaster Miloš Valent. 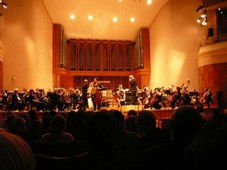 The only satisfaction for the artists remains the fact that in the week preceding the concert they had recorded the piece on a CD, which will be released in October 2010 by the Pavian Records label. 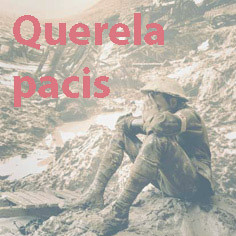 To see the atmosphere during the recording check the Querela pacis page on our website. A new composition Querela pacis by Vladimír Godár will be premiered at the festival Bažant Pohoda (http://www.pohodafestival.sk) on July 9, 2010, 12 pm (or on July 10, 00 am) at the Trenčín airport. The approved performers will participate in the event: Cathedral Choir of St. Martin led by Dušan Bill, Solamente naturali ensemble with the concertmaster Miloš Valent and soloists Hilda Gulyásová, Petra Noskaiová and Tomáš Šelc. The whole project will be led by the baton of Andrew Parrott. The piece of the same title was premiered in the summer 2009 at the Europa Cantat festival. However, it was not performed completely and the composer is going to rework it now and give it a totally new shape. Therefore we will have an opportunity to listen to a fully new composition in July. During this week from 5th to 9th July the musicans were recording the piece Querela pacis on a CD. The CD will be released in October on the label Pavian Records, which has also released the very successful CD Mater featuring Iva Bittová with the pieces by Vladimír Godár. Excellent string quartet from The Netherlands Matangi Quartet (http://www.matangi.nl) has released a new CD Candybox, String quartet “sweets” from Bartok to Jenkins. Among the composers the name Vladimír Godár may be found, too, namely his piece Ground, one movement from Concerto grosso, arranged for string quartet and harpsichord by Gene Carl. Marvelous CD, beautiful pieces, splendid performance. 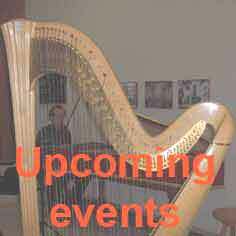 On May 19, 2010 at 6.00 pm a concert titled Slavonic Lullabies took place at the Clarissean Church in Bratislava as a part of a festive opening of the Anasoft litera fest 2010. The singer Petra Noskaiová was accompanied by Vladimír Godár at the piano and we had an opportunity to listen to songs by Czech, Polish, Russian, Ukrainian, Hungarian and Slovak composers (Dvořák, Kabeláč, Tchaikovsky, Musorgsky, Rimsky-Korsakov, Borodin, Shostakovich, Zarębski, Komeda Trzciński, Silvestrov, Bartók, Kardoš, Godár). Slovak Radio Symphonic Orchestra under the baton of Oldřich Vlček has performed Vladimír Godár’s composition Via lucis at the 10th concert of the season (March 31, 2010). Thank you for a gorgeous experience! Vladimír Godár has just recently finished and in these days (February 2010) recorded the music to a new Slovak film Flying Cyprian (http://www.lietajucicyprian.sk) made by a young film director Marianna Čengel Solčanská. His music collaborators were well-known music ensemble Solamente naturali led by Miloš Valent, Bratislava Conservatory Chamber Choir led by Dušan Bill and a solo singer Hilda Gulyasová.